Can flash save the world? 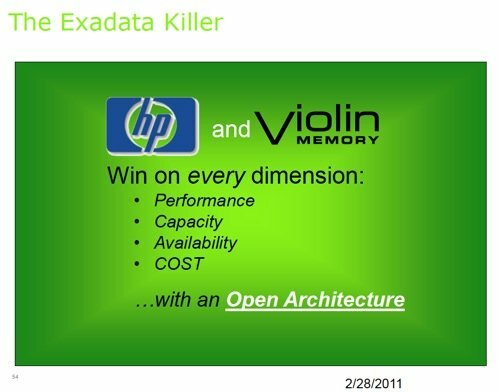 HP is using flash from Violin Memory to create Oracle Exadata-killing high-performance data base systems. This follows on from the fiasco of Oracle allegedly preventing HP from submitting a good TPC-C benchmark based on an HP DL980 server enhanced with Violin Memory's flash storage. As you can see in the 62-slide deck1 HP's Exadata-killing HPDBS (High-Performance Database Solution) is a DL980 G7 server with Violin Memory 3200 solid state storage arrays. HP stresses that its HPDS is open with a choice of Linux, Oracle Linux or Windows operating environments, and supports all current versions of Oracle's database: not just Oracle 11g as is the case with Exadata. Oracle's Exadata X2-2 and X2-8 configurations use 5TB of Sun FlashFire PCI flash storage for "intelligent, adaptive caching" delivering "10 times faster I/O response time." HP's 8U DL980 G7 uses 4-, 6- or 8-core Xeon 7500/6500 series processors; we imagine that Xeon E7s will come along as fast as HP can integrate them. The flash comes in a 3U enclosure, with either 10TB of single-level cell or 40TB of multi-level cell capacity, and HP is very assertive about its sustained performance of 250,000 IOPS. The deck has a slide showing how solid state storage from Virident (TachION), Fusion-io (ioDrive Duo), OCZ (Colossus), TMS (RamSan 20) and Intel (X-25M) all have a substantial decrease in performance once the devices fill up with data. 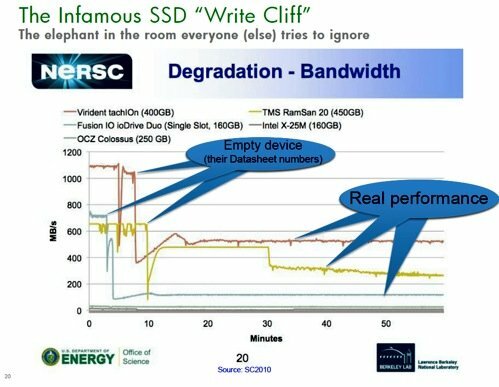 HP describes this phenomenon as the "infamous SSD write cliff". Violin Memory flash doesn't fall off this cliff, sustaining its performance, HP says, "for years." The sustained 100 per cent write performance number is more than 220,000 IOPS and this, HP says, is the worst case parameter for the other flash products. HP says its HPDBS has much lower cost-per-transaction than Oracle's Exadata, more total system IOPS, more usable storage, and a much lower system cost. The three-year total cost of ownership (TCO) for an Exadata X2-2 large full rack at list is $12,246,755 versus an equivalent HPDBS configuration's $6,694,588, 45.4 per cent of the Oracle TCO. There is much advice and competitive information in this sales presentation to help HP sales people take on Exadata. It claims that if the reps run a proof of concept with customers there will be a 94 per cent win rate. 1.The slide deck link no longer works. Contact the author for a copy.